Brushing Your Teeth – One of the most ancient of practices, brushing your teeth removes harmful bacteria and debris by agitating them with the back and forth movement of the bristles. In addition to clearing away these undesirables, brushing your teeth also aids in fortifying your enamel, the outer surface of your ivories that protects them from the harsh environment in your mouth. Flossing – While brushing your teeth is quite essential to your oral health, it can only address around 60 percent of the surface of your teeth. To get to the remaining 40 percent, flossing is required. Its flexible nature allows it to burrow between your teeth to extract hidden food particles and bacteria. Limiting Snack Food Consumption – The better you are at controlling snack food cravings, the better your oral health will be. You can replace the snacks with whole foods like fruits and vegetables that are more complimentary to a stable environment in your oral cavity. 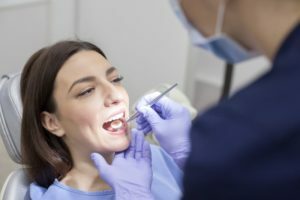 Visiting Your Dentist – A final step you can take to fortify your dental wellness is to visit your dentist on a regular basis for cleanings and checkups. These appointments ensure that stubborn plaque and tartar are removed from your mouth before they cause havoc and that any developing issues are addressed before they morph into something worse. Now you are better educated on how to take control of your oral cavity and provide more stability to your health. The next step is to take action. To be proactive is to take the initiative to act on the condition of your oral health before a problem starts. That amounts to you setting the above information into motion by engaging in the practices. Taking this approach ensures that you won’t have to endure the host of oral problems that could have easily been prevented. To learn about other ways to fortify your oral health and schedule your preventive care visit, reach out to your dentist in Annapolis today. A graduate of the University of Maryland and Baltimore College of Dental Surgery, Dr. Earl Chambers has been practicing dentistry for over twenty years. Still, he remains eager to learn more and grow, which is why he participates in continuing education courses. Additionally, Dr. Chambers maintains affiliation with several professional organizations to enhance the care he provides to patients at Chambers Family Dentistry. He can be reached for more information through his website.